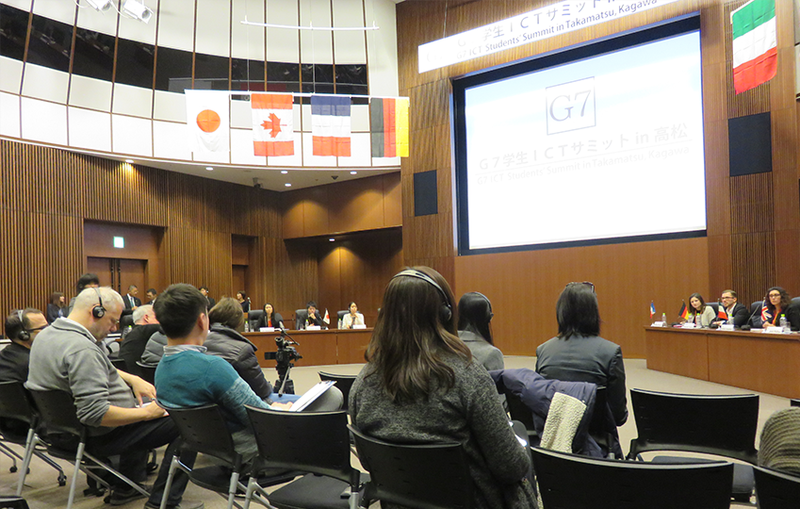 A press tour was conducted on March 5 (Sat) and 6 (Sun), 2016, to Kagawa and Kurashiki, two of the host locations for this year's G7 ministers' meetings. 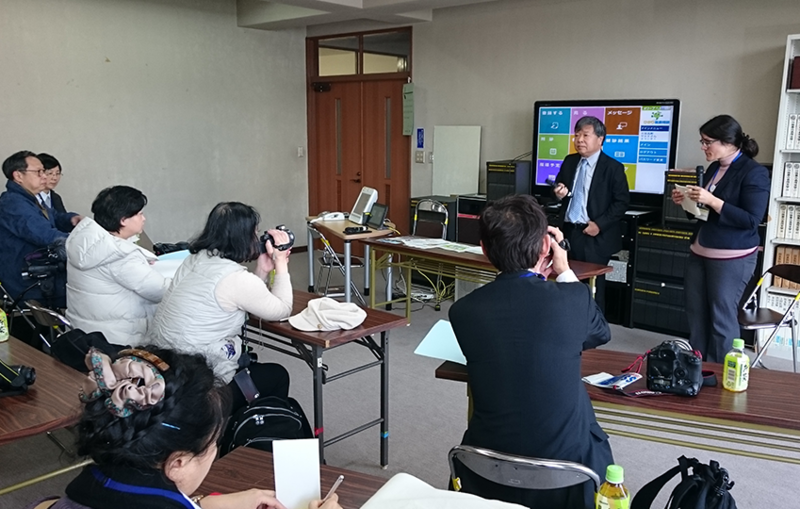 On March 5 (Sat) and 6 (Sun), 2016, a press tour was conducted at Takamatsu City, Kagawa Prefecture, the location of the G7 ICT Ministers' Meeting, and at Kurashiki City, Okayama Prefecture, the location of the G7 Education Ministers' Meeting. The purpose of the tour was for members of the foreign press to appreciate the beauty of the Seto Inland Sea and the distinct cultural, food and other attractions of each city. 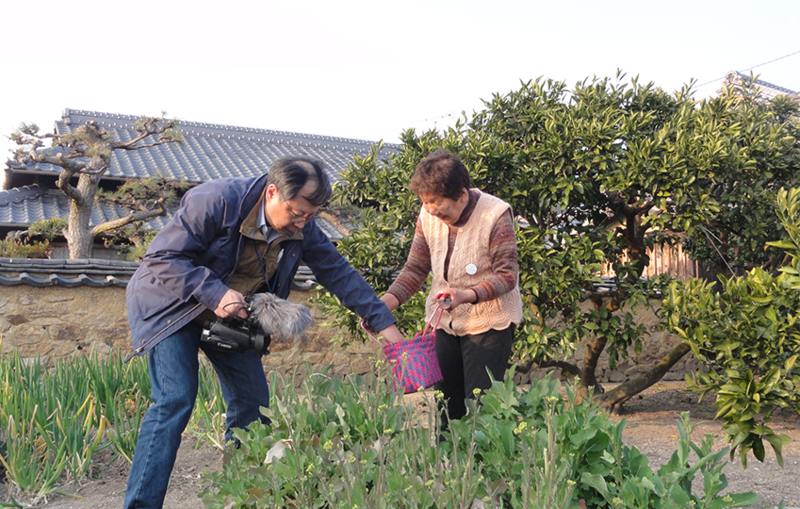 On the first day of the tour, members of the press visited Shodoshima and Teshima in Kagawa Prefecture. They covered initiatives promoting regional development using ICT in remote rural areas and the scenes of production for artworks of the Setouchi Triennale Art Festival. They also had an overnight experience at private homes on Teshima, an island next to Shodoshima. The following day, they visited Kurashiki City. After gathering material on the Bikan Historical Quarter, they covered the G7 Kurashiki Children's Summit, which was also being held in Kurashiki. 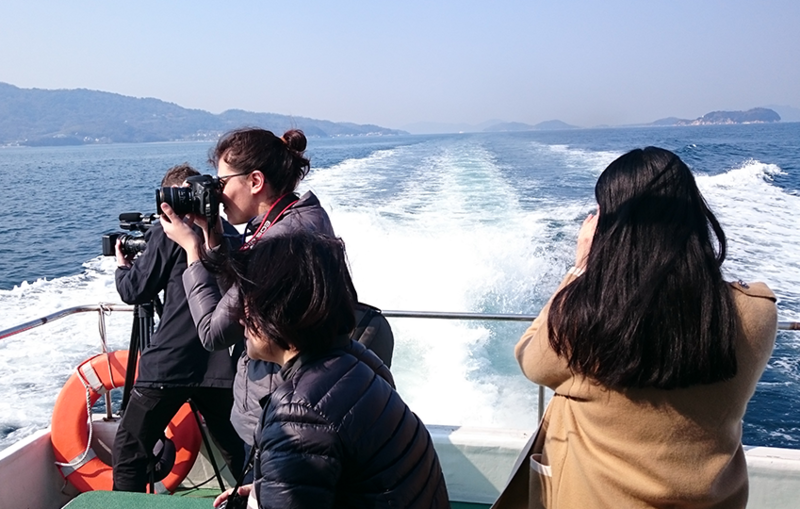 Members of the press took part in a cruise of the Seto Inland Sea, from Takamatsu Port to Shodoshima. They took great delight in taking videos and photos of the calm waters as well as the beautiful island scenery. To start, Mr. Yukio Shiota, Mayor of Shodoshima Town, talked about measures for using ICT to promote development on isolated islands. Then, local people who are actually utilizing those measures were invited and the press covered them receiving health guidance. The Q&A session was also a lively affair with participants actively exchanging opinions and questions. After the interview with the Shodoshima Town government, the tour moved to Ristorante Furyu. 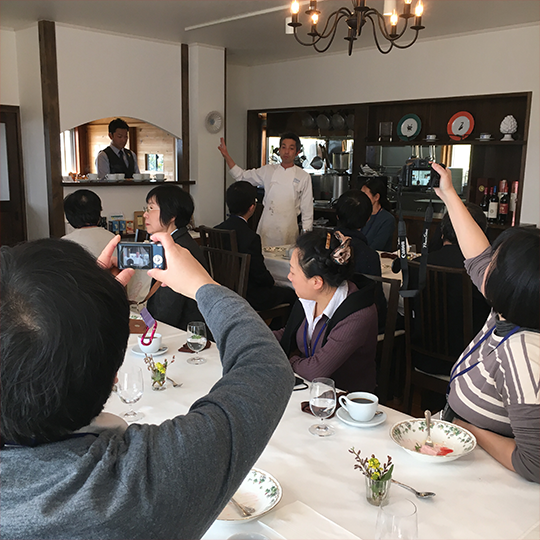 There, members of the press sat with the Mayor of Shodoshima Town and ate an Italian lunch made using local specialties, together with two people who had moved to Shodoshima Town and Tonosho Town from outside the prefecture to promote regional development using ICT. The owner-chef of Furyu, Mr. Nobuto Shibuya, is also a migrant to Shodoshima, and uses food to express the charms of the region. After lunch, the members of the press interviewed each of the migrants to Shodoshima, and discussed the various attractions of Kagawa's islands. 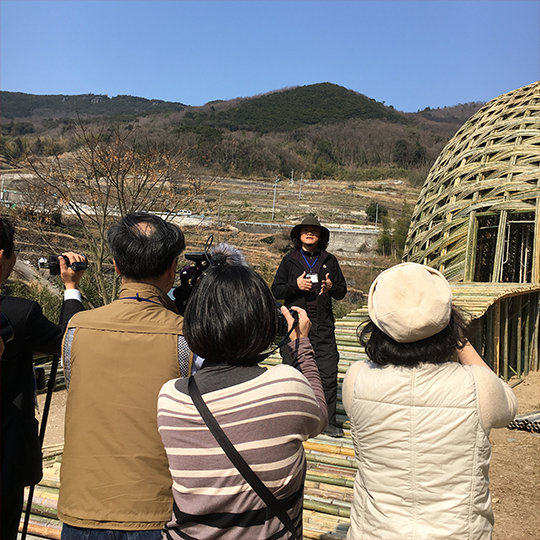 Members of the press interviewed Taiwanese artist, Wang Wen Chih, about his work "Dream of Olive," a massive bamboo dome and one of the artworks in the Setouchi Triennale 2016 art festival being held from March 20, 2016. The sizeable artwork constructed from about 4,000 pieces of locally grown bamboo was close to completion at the time of their tour, and a team of local residents and volunteers were in the midst of production. The artwork is located in the Nakayama district of Shodoshima, and so members of the press also enjoyed the majestic sight of the Nakayama Senmaida (literally "a thousand rice fields"), which was selected as one of the top 100 terraced rice fields of Japan. 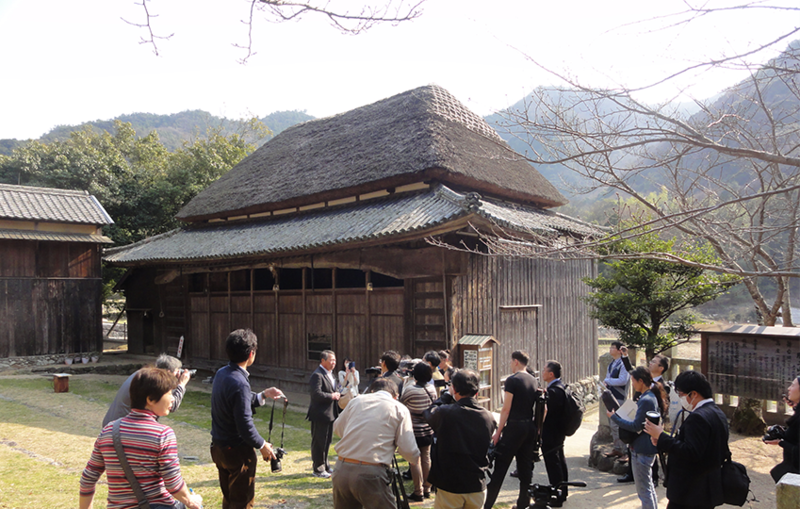 From the Nakayama district of Shodoshima Town, the tour moved to the Hitoyama District of Tonosho Town to gather material about the stage of the Hitoyama Farmers' Kabuki. It is said that the Hitoyama Kabuki originates from a play that was performed in a temporary shelter to celebrate the completion of the Kaerugoike Pond in 1686. 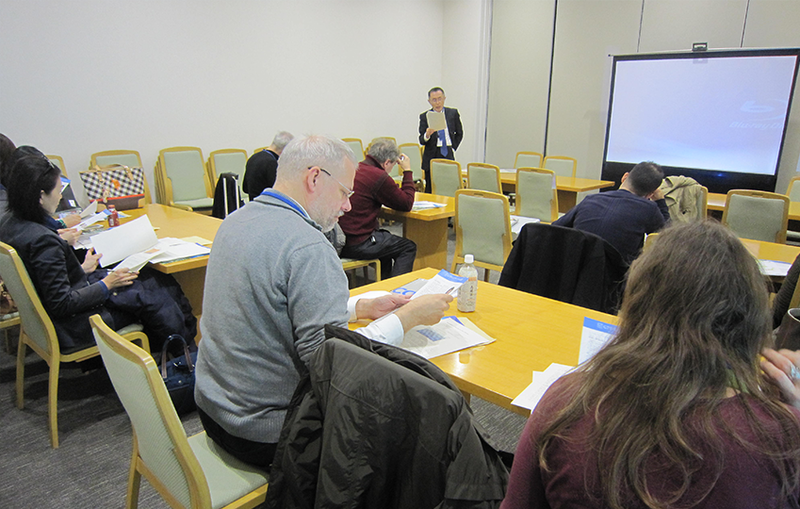 During the interview, an explanation was provided by Mr. Ikuo Sasaki, Chairman of the Hitoyama Farmers' Kabuki Preservation Society, and the members of the press listened with interest about the rich cultural traditions. The tour then moved from Tonosho Port to Teshima, where the members of the press split up to experience and report on staying overnight in private homes. They had a great time, chatting with the local residents while experiencing the island life, such as harvesting vegetables and cooking meals. On the island which, at first glance, might seem inconvenient, they took great delight in witnessing the rich lives of the locals, the beautiful views of the islands dotted in the Seto Inland Sea, and the warm hospitality of their host families. 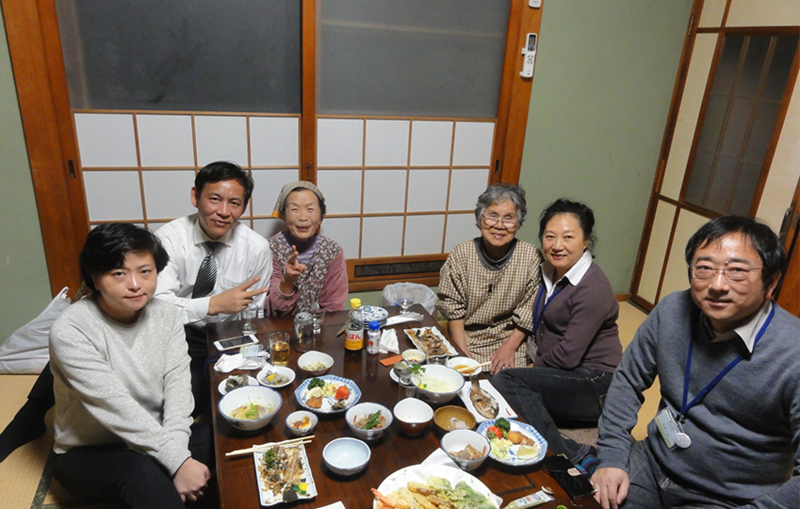 The following day, they received as warm a send-off from the families as their first greeting upon arrival, before heading by ferry toward Kurashiki. 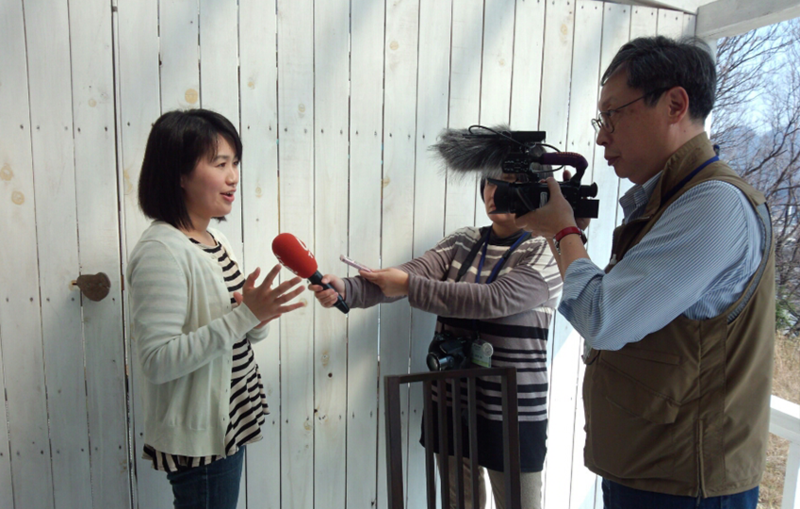 Together with coverage of the G7 Student ICT Summit that was held on December 12 (Sat), 2015 at the Kagawa International Hall, a press tour was organized for foreign correspondents that allowed them to see famous works of art at Naoshima, Chichu Art Museum on Teshima, and the Teshima Art Museum, as well as Ritsurin Park in Takamatsu City, and to cruise the Seto Inland Sea. 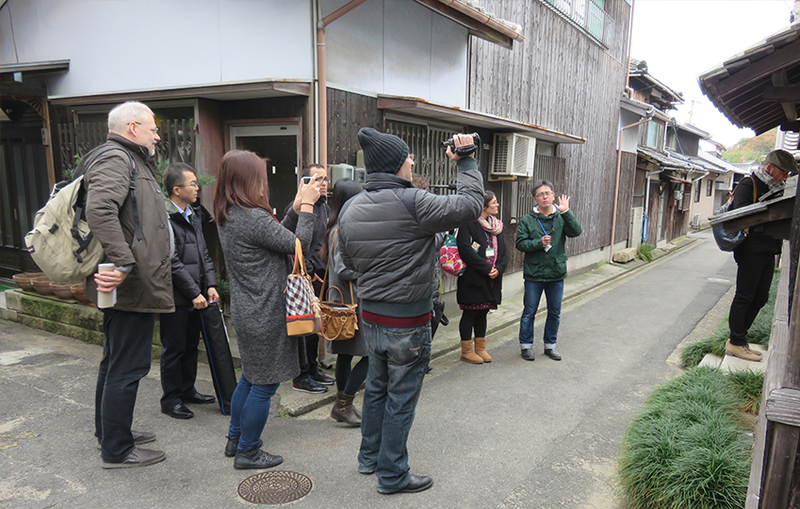 Members of the press also enjoyed the delicious foods of the Seto Inland Sea and Kagawa on the tours. Members of the press were provided with materials that included basic information on the Summit, the G7 ICT Ministers' Meeting in Takamatsu, Kagawa, as well as about Kagawa City at Takamatsu Airport and learned about the various points of appeal of Kagawa by viewing a tourism DVD. After covering the heated debates by the students, a press conference was held by the participants on the press tour and local media. Coverage was quite lively, with the tour participants asking questions to the participating students about each country. Click here for information about the G7 Student ICT Summit. 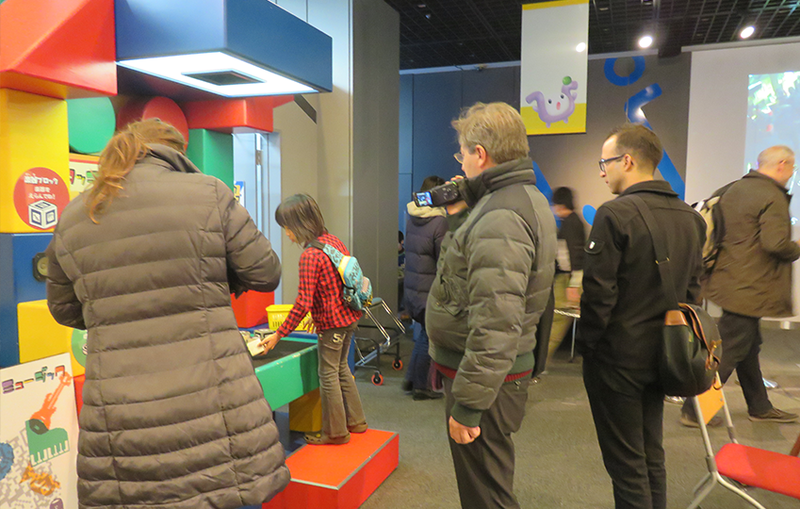 After the student summit, the members of the press visited the Information & Science Museum (e-topia Kagawa) and got footage of children experiencing the latest information and communications technology. 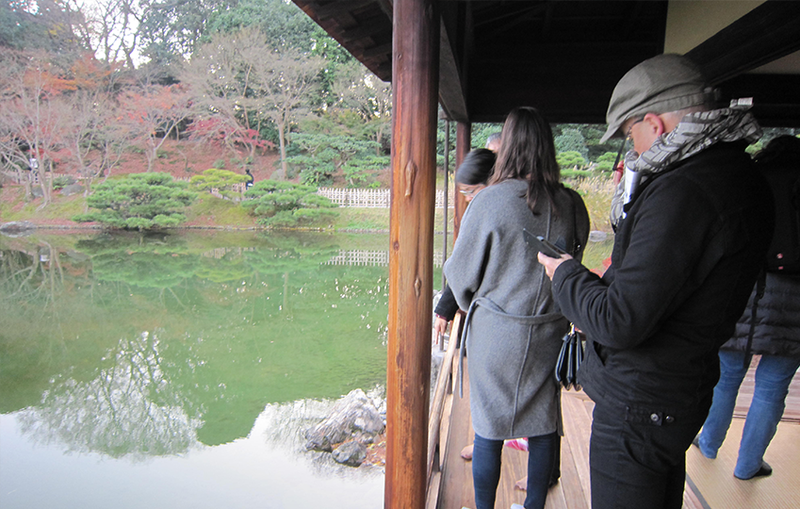 The following Sunday, members of the press visited Naoshima and Teshima to view and cover various works of art. They received explanations about the various works of art, such as the Chichu Art Museum, Art House Project, and Teshima Art Museum in Kagawa Prefecture, which today is referred to as a prefecture of art. 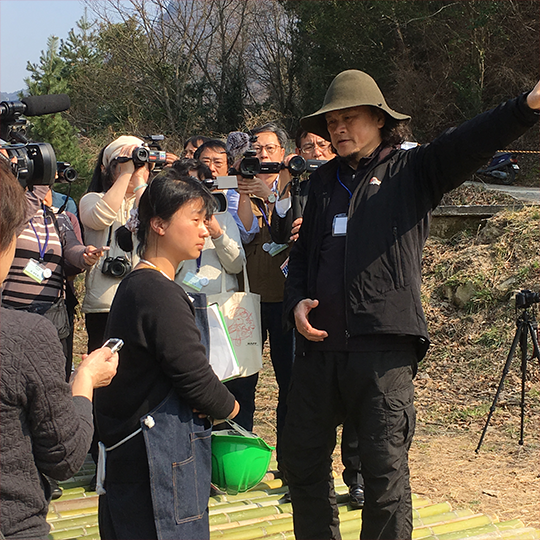 After this, the members of the press enjoyed a relaxing and rich time with tea in the beautiful, ever-changing scenery ("one step, one view") of Ritsurin Park. Nine people from nine companies mainly affiliated with the Foreign Correspondents' Club.